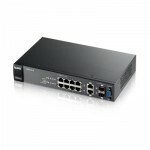 Zyxel XGS2210/GS2210 Series has a rich Layer 2 feature set that can shape the traffic for diverse VoIP, video conference, IPTV and IP surveillance deployments and provide hotels, businesses and educational institutions greater agility and more effective traffic management for the converged applications of today. The XGS2210 Series allows creating a physical stack through two standard 10-Gigabit SFP+ ports to facilitate management for multiple switches with one single interface. 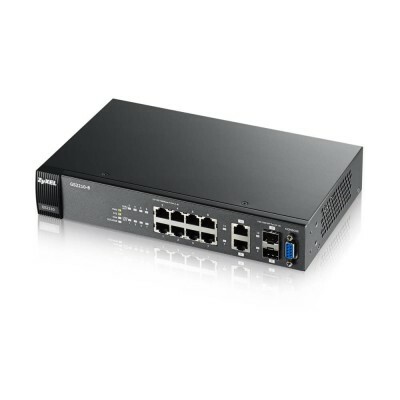 The Zyxel XGS2210/GS2210 Series PoE switches support the IEEE 802.3af PoE and 802.3at PoE Plus standards, which provide up to 30 watts of power per port for advanced Powered Devices (PD) like 802.11ac wireless APs and video IP phones. The high power budget enables the XGS2210/GS2210 PoE switches to comfortably accommodate the PDs required in a modern network edge. Zyxel XGS2210/GS2210 Series offers enhanced control and isolation for improved convergence of video, voice and data. Such advanced defense mechanisms as IP source guard, DHCP snooping, and ARP inspection can detect and block intentional network attacks. Combining multiple L2, L3 and L4 filtering mechanisms with such education - and hospitality friendly features as MAC freeze, port isolation and guest VLAN, the Zyxel XGS2210/GS2210 Series offers a high level of security, flexibility and control for diverse access layer deployments. Aiming for relieving our customers from repetitive operations of deploying and managing a network, Zyxel One Network is designed to simplify the configuration, management, and troubleshooting, allowing our customers to focus on the business priorities. Zyxel One Network presents an easy-to-use tool, Zyxel One Network Utility (ZON Utility), to realize speed network setup. Zyxel Smart Connect allows Zyxel networking equipment to be aware and recognize each other and further facilitating the network maintenance via one-click remote functions such as factory reset or power cycling. Zyxel One Network redefines the network integration across multiple networking products from switch to Wi-Fi AP and to Gateway.